This article is about the enemies from Super Mario Land 2: 6 Golden Coins. For the enemies from Mario's Time Machine, see Shark (Mario's Time Machine). Sharks are enemies found in the Turtle Zone in Super Mario Land 2: 6 Golden Coins. Normally, they swim slowly, but when Mario gets close to them, they start swimming faster, charging at him. Since they are underwater enemies, Mario can not stomp on them, and unlike many other enemies Fireballs do not affect them. The only way to defeat them is with a Star, or, in rare cases, a Koopa Shell from the surface. They wear boxing gloves, but they don't seem to use them against Mario. 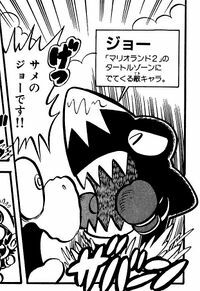 In volume 9 of the Super Mario-Kun, Mario, Luigi, and Yoshi encounter a Shark during their boat trip. The Shark attacks them, but Mario throws Yoshi to the Shark to defeat it, although Yoshi gets injured. ↑ Nintendo Power Volume 43, page 49. This page was last edited on December 30, 2018, at 17:08.